Check out the buzzing city of Derry~Londonderry, then use it as your base to explore the coastal charm and remote rocky coves of the Causeway Coastal Route and the Wild Atlantic Way. 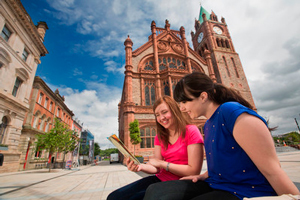 For such a small city, there’s an awful lot to see and do in Derry~Londonderry. Take in the sights, stroll through centuries of history and indulge in some fantastic food. 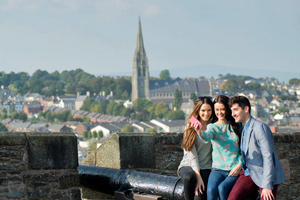 Derry~Londonderry is one of the best preserved walled cities in Europe, and a walk along the top of the beautiful 17th century walls, past the preserved cannons, will give a bird’s eye view across the Renaissance-style street plan and over to the River Foyle. The walls were started in 1613 and took about five years to build, which is pretty good going when you see how solid they are. The city’s extraordinary history is told in several museums that dot the city. 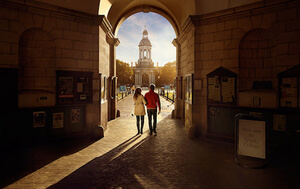 The Tower Museum will take you from earliest prehistory, from the ancient tribes of Ireland through to today, by way of the Spanish Armada. 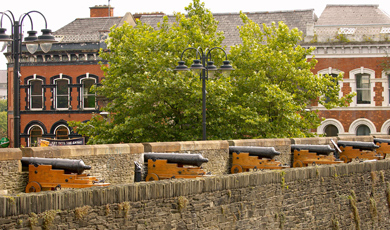 The Siege Museum tells the story of the Apprentice Boys and the siege of Derry~Londonderry in 1688, when the English king found the walls of the city barred to him – an incident that shaped the history of Ireland. The Museum of Free Derry in the Bogside tells the story of the modern city (or at least the last century) and the birth of its civil rights movement. Drop into the neo-Gothic Guildhall for a coffee and a peek at the permanent exhibition on the history of the region. Book a walking tour of the murals of the Bogside. You can meet the artists and hear their stories as you look at these pieces of living history. For all this rich history, there’s a busy and thriving cultural scene in Derry~Londonderry that looks to the future. Check out the work of modern artists, some of whom are local, some from further afield, at the Centre for Contemporary Art and the Warehouse gallery. It’s not just artists but artisans who have been drawn to the city. You’ll find you’re in foodie heaven here, with chefs using wonderful local produce to create some of the most innovative and exciting cooking in the country. There’s also a thriving local craft beer scene – keep an eye peeled for quirkily named beers at the Walled City Brewery, and distinctive hand-crafted local brews from Northbound Brewery in the city's many friendly pubs. 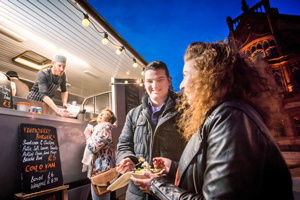 Visit the Walled City Market in Guildhall Square, where local producers sell their wares on the first Saturday of every month. 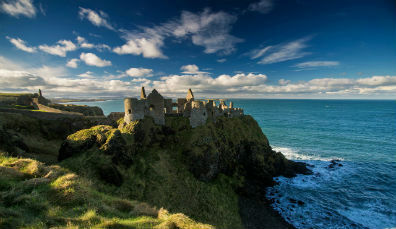 Heading north and then east from the Walled City of Derry~Londonderry takes you along the Causeway Coastal Route, where the views are breathtaking and the welcome is warm. The furthest point of our trip is the Carrick-a-Rede rope bridge, however, between Derry~Londonderry and Carrick-a-Rede there is so much to see, you could pack a few days with stops and wanders. 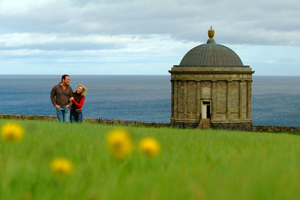 Driving east for just under an hour will get you to stunning Mussenden Temple, a neo-classical folly perched on high above the beach. It’s an extraordinarily isolated and romantic spot – no surprises that it’s very popular for weddings. Stroll around it and enjoy panoramic views down to the sandy beach below. 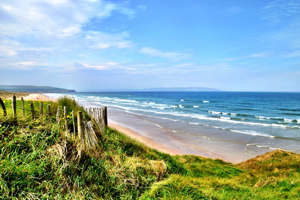 You’re very close to Portstewart Strand – perfect for a swim (at least a quick dip!) or a long walk. Think crashing waves and golden sand that stretches on forever. Portstewart Golf Club is nearby, and is rightly proud of its stunning setting among the dunes. A close neighbour is the famous Royal Portrush Golf Club, which is gearing up to host The Open in 2019. It’s a wrench to get back in the car after the fresh air, but it’s worth it, because not far away is the craggy, mysterious ruin of Dunluce Castle. It is perched right on the cliff edge (quite literally – some of it has already tumbled into the sea, though don’t worry, that was a few centuries ago) and has a feel of a medieval epic. From here, it’s just six minutes in the car heading south to the village of Bushmills, home to the oldest working whiskey distillery on the island of Ireland, where you can take a tour and sample the product (if you’re not driving!). 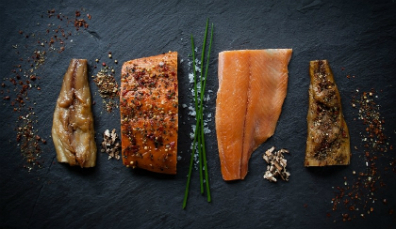 Stop for lunch in Bushmills – you'll find exquisite cuisine at Tartine and The French Rooms in the heart of the town. Book in advance for trips to the incredible UNESCO World Heritage site of the Giant’s Causeway or cross the Carrick-a-Rede rope bridge. If you're feeling energetic, take the road less traveled and embark on a stunning five mile hike along the Clifftop Experience Walk, or enjoy a glorious hike across the undulating clifftop path from the ruin of Dunseverick Castle. From here it’s a short hop to Ballintoy Harbour, one of the many breathtaking Game of Thrones® filming locations dotted along the Causeway Coast. 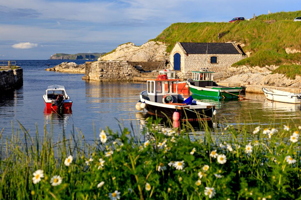 Have a wander and a cup of tea in the village of Ballycastle near Ballintoy Harbour – it’s a beautiful spot to while away an afternoon. During November, two very special festivals arrive to these shores. 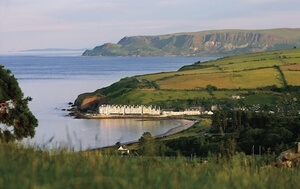 Atlantic Sessions brings 50 musicians and music to everyone’s ears, while Taste Causeway is a delight for the senses with a memorable foodie experience between Limavady and Cushendall. 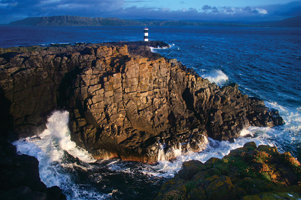 Add an extra day onto your adventure with a trip to the wonderful Rathlin Island. Cars aren’t allowed, so go for walking, birdwatching, the slow pace and Ireland's only upside-down lighthouse. Legends thrive here, too, with Robert the Bruce seemingly inspired by watching the dogged determination of a tiny spider weaving his web – just ask the locals to tell you the tale. 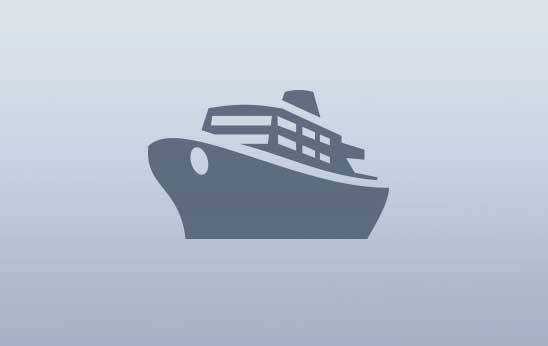 Ferries take 25-40 minutes from Ballycastle, so book your ticket early during summer months. 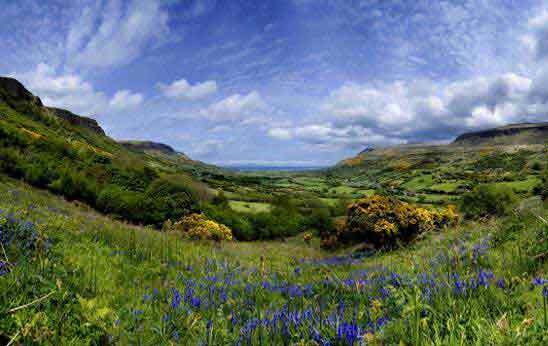 To the north-west of Derry~Londonderry you'll find the Inishowen Peninsula – a remote, rocky and spectacularly beautiful place and the start of the mighty Wild Atlantic Way. Just over an hour north of Derry~Londonderry at the far tip of the Inishowen Peninsula, lies Malin Head. It is not only a spectacular spot, untamed and rugged in any weather, but it marks the start (or end, depending on your viewpoint) of the Wild Atlantic Way. Walk up to Banba’s Crown, at the northernmost tip of the whole island of Ireland, and keep an eye out for basking sharks. If you're a lover of the sea and all its wonderful creatures, be sure to take a whale-spotting boat tour from Inishowen's Bunagee Pier. 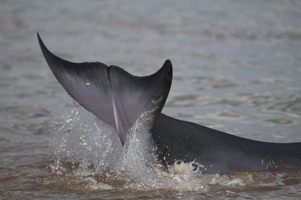 You never know what may breach the surface as you glide across the deep blue Atlantic waves, but if luck is on your side you could be greeted by minke whales, common and bottlenose dolphins, porpoises, basking sharks and sunfish. Always wanted to see the Northern Lights? 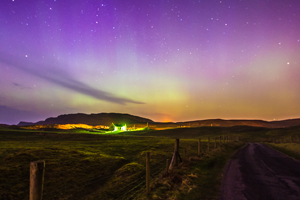 Due to its northerly position and lack of light pollution, County Donegal's Inishowen Peninsula is the perfect place to see this amazing natural phenomenon. 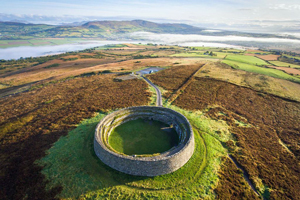 As you head south, just as you’re leaving the peninsula, stop and enjoy spectacular views of Lough Foyle and Lough Swilly from the 250-metre high prehistoric stone fort of Grianán of Aileach. 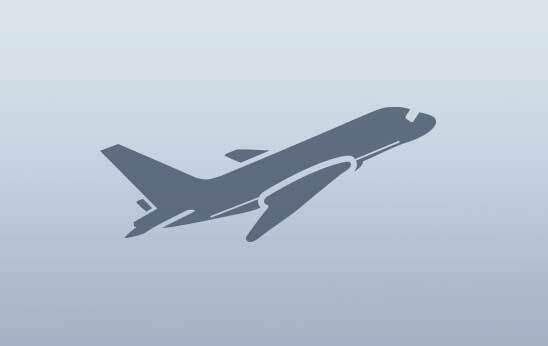 Its fame has spread far and wide, and was even mentioned by Ptolemy, the ancient Greek mathematician. The fort is also said to be the inspiration behind the curved lines and stone walls of the nearby Church of St Aengus in Burt – regarded as a masterpiece of design. 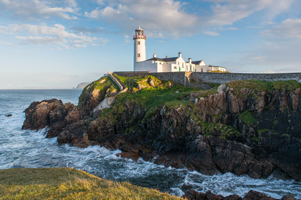 At the top of the next headland is Fanad Head Lighthouse, which has safeguarded seafarers since 1817. Climb to the top of this seaside beacon for awesome ocean views as the wind whirls around you and the crashing waves pummel the rocks below. You can take the tour or even stay the night and soak up the magic of this remote spot. Who could resist playing lightkeeper by staying in one of its beautiful self-catering cottages? All you have to do is sleep easy on the edge of the world. It's time head inland for a complete contrast. This is just one of the highlights of this region, that you can travel from wild and craggy coast deep into the silence of the mountains in less than an hour. 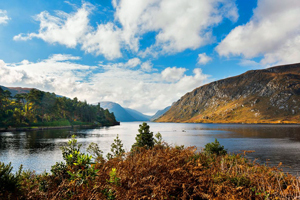 The Derryveagh Mountains are home to Glenveagh Castle and National Park. The park is a huge conservation area filled with lakes, waterfalls and ancient oak woodlands. In the heart of it lies the castle, built in the 19th century. Take a tour and hear of the Hollywood legends who have stayed here. Take a couple of hours and choose one of the well-marked walking routes to really immerse yourself in this magical place. 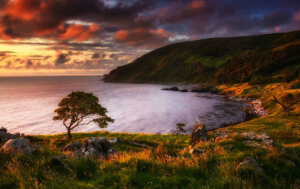 Journey along the coast beyond the natural beauty of Glenveagh to experience a kaleidoscope of colours during a sunset never to be forgotten at our final stop: the gorily named Bloody Foreland in County Donegal. But don’t fret, records do not show that anything awful has actually happened here – the name was coined in response to the light. Find yourself a good spot and watch as the westering sun’s rays bring out a reddish glow over the rocks and sea. 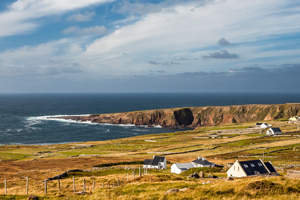 Add another day to your trip and catch a ferry from Magheraroarty to Tory Island. This tiny isle is home to many artists, who love the light and the views. Jaw-dropping cliff views and endless gourmet delights: a trip along Ireland’s Wild Atlantic Way is sure to give you an appetite. It's cosmopolitan, creative and steeped in history – but it’s the unique combination of warmth and wit that makes Derry~Londonderry so special. 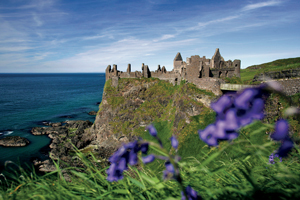 Stretching from Belfast to Derry~Londonderry and taking in some of Ireland's most incredible sights, the Causeway Coastal Route is a true legend.